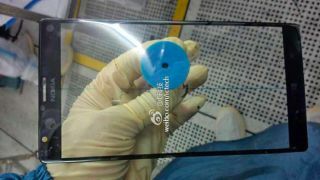 A pocket stretching Lumia on the way? Rumours have been swirling lately suggesting Nokia will boost its line of Lumia Windows Phones with a handset to straddle that line in the sand between smartphone and tablet. Could this be our first glimpse of what's to come? This purported front screen panel component baring the Nokia braning, revealed by ICTech today, looks like it could sit on the 6-inch (at least) device thought to be in the works. Judging by the rubber gloves it appears the photo has been taken by a sneaky worker on the production line (or a dentist's surgery, who knows?). Any launch of a 6-inch Lumia device would likely come before the year is out as the Finnish company looks to capitalise on improving sales figures for its Windows Phone devices. At the launch of the Nokia Lumia 1020 camera phone earlier this month, the company promised more big launches before the end of the year. It's unlikely that, in his comments at the time, embattled CEO Stephen Elop meant the more affordable Lumia 625 device, which showed itself to the world earlier this week. This means there's more to come. Nokia is also rumoured to be plotting a tablet running Windows RT. Back in May the company admitted to being "very interested" in tablets, while a purported image of said device appeared on the web earlier in July. Lumia sales are way up, but Nokia isn't out of the woods yet. Far from it, in fact.